We are your Uptown Dallas Chiropractor for Kinesiology Taping … GET TAPED! We’ve all seen the Olympians, whether it was from Track & Field athletes to the 3-time gold medalist beach volleyball players, Misti May and Kerri Walsh, and thought what is all that colorful tape on them?!? Think no further! It’s kinesio tape or power tape. Power Taping helps with the actual taping of an active muscle whether it’s for rehabilitation of muscles, postural control, pregnancy support, edema/inflammation control and sports performance like the Olympians! Kinesiology taping is the rehabilitative taping technique designed to enhance the body’s natural healing process. Kinesiology taping provides support and stability to muscles and joints without restricting the body’s range of motion. In addition, Kinesiology taping provides extended soft tissue manipulation which prolongs the benefits of manual therapy. Kinesiology is safe for all ages – ranging from pediatric to geriatric – and successfully treats a variety of orthopedic, neuromuscular, neurological and other medical conditions. 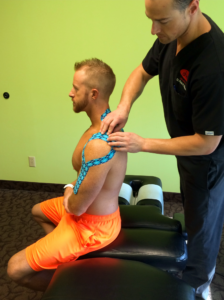 The Kinesiology therapeutic taping technique offers your patient the support they are looking for by targeting different receptors within the somatosensory system. Kinesiology taping has been proven to have positive physiological effects on the skin, lymphatic and circulatory system, fascia, muscles, ligaments, tendons, and joints. It can be used in conjunction with a multitude of other treatments and is effective for preventative measures as well as during the rehabilitative phases on an injury. RockTape is a special kind of tape known as kinesiology tape. First used by acupuncturists and chiropractors in Japan, today kinesiology tape is used by practitioners throughout the world to treat injuries and improve sports performance. While the use of kinesiology is often associated with athletes such as Serena Williams, Kerri Walsh and Lance Armstrong, the reality is that RockTape is effective for the treatment of a wide variety of problems, not just sports injuries.